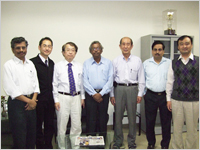 Director Yamamoto (third from left) in a commemorative photograph with Dr. Chakrabarti (fourth from left), acting director of NICED. On 2 December 2012 Dr. Shin-ichi Yamamato, Executive Director for research led a party of Okayama University delegates to Kolkata, West Bengal, India to visit the National Institute of Cholera and Enteric Diseases (NICED), the I.D. & B.G. Hospital, University of Calcutta, and the Collaborative Research Center of Okayama University for Infectious Diseases in India—the director of the center is Dr. Sumio Shinoda, specially appointed / honorary professor. Established by Okayama University in 2007, the center is the only Japanese research institute for infectious diseases for India, and currently there are three researchers and one administrative employee from Okayama University working there with researchers in India. This visit by Shin-ichi Yamamato and his colleagues was undertaken as part of enhancing cooperation in winning the war against enteric diseases such as cholera, which still take many lives in India. Dr. Yamamoto's party visited NICED, hospitals and universities for a firsthand look at the treatment of patients and for direct discussions with scientists on the current status of research on infectious diseases in India. A joint seminar was held by NICED and Okayama University, with emphasis how to strengthen coordination in the future. This visit to the center also enabled the Okayama group enhance their networks with counterparts in India for further research promotion.